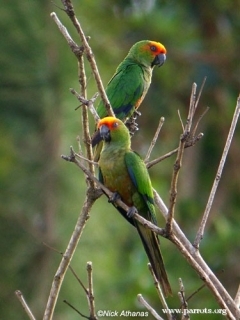 The Golden-capped Conure is often seen with the more common Peach-fronted Conure (Eupsittula aurea). A.a. auricapillus: Both adults forehead and lores to area around eyes orange/red, yellow forecrown, some birds cheeks yellow as well; abdomen and lower breast red; rump and low back margined red. Bill black. Eye ring grey, eye dull yellow. A.a. aurifrons: As in auricapillus, but sides of head, throat and upper breast darker green with no yellow; also rump and low back red absent. As in adult but with less evident head markings, in particular the yellow on the forecrown; cheeks deeper green; almost no red on rump and low back; red of underparts on flanks and centre of abdomen only. Eye ring pale grey, eye brown. Like A. jandaya; short, quick tweea tweea. Established in the US; less so in Europe. Aviary or suspended enclosure, minimum length 2 or 3m (6.5 or 9.8 ft). Fruit such as: apple, pear, orange, cactus fruits, pomegranate, forming about 30 percent of diet; fresh vegetables if taken, such as: carrot, celery, green beans and peas, corn on the cob, green leaves; spray millet, small seed, complete pellet. Provide overhead misters or shallow water bowls for bathing; bird-safe, unsprayed flowering, fir, pine, willow or elder branches, climbing toys (ladders, ropes, swings), puzzle toys, wooden block or vegetable tanned leather chew toys. Vertical box, 12" x 12" x 18" (30.5cm x 30.5cm x 46cm). Extensive clearance for crops (coffee, soybean and sugarcane) and other agriculture; trapping for trade may have had significant effect in the 1980s. A.a. auricapillus: Restricted to N and C Bahia; birds from S Bahia intermediate between this subspecies and A. aurifrons. A.a. aurifrons: SE Brazil, from Minas Gerais and southern Goias south to Santa Catarina. Occurs in forest, forest edge and clearings, including coastal moist evergreen Atlantic forest and deciduous and cerrado-type woodlands of interior. Up to 2180m (7150 ft). Eats seeds and fruits, maize, okra and sweet cultivated soft fruits. Gregarious, found in flocks of 12-20, rarely 40.